Particleboard has no grain and readily yields to almost any type of saw. The blade determines the efficiency, accuracy and cleanliness of any cut. 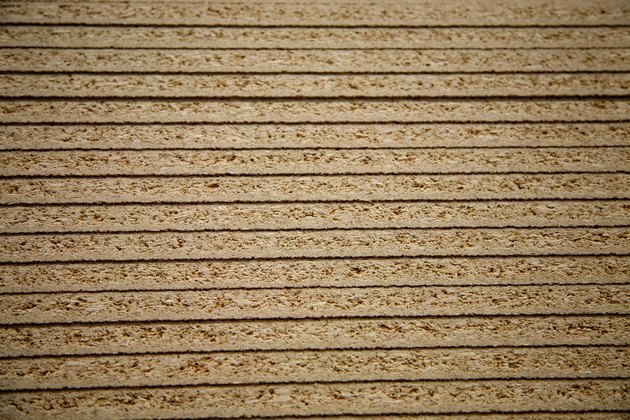 Particleboard typically is available in 3/4-by-48-by-96-inch sheets; a table saw works best for these. If there's not a table saw handy, circular saws can do the job. Jigsaws are appropriate for curved cuts. Turn off the breaker to the saw. Install a 60-tooth, carbide-tipped, alternating-top-bevel blade on the table saw. Raise the blade to 1 1/4 inch in height from the top of the table to the highest tooth. Turn on the breaker. Don safety glasses and a face mask. Place sawhorses on the exit side of the saw and on the left side to aid in supporting the particleboard. The sawhorses should be slick and smooth on top. The top of the sawhorses should be even with the top of the table or no more than 1/4-inch lower. Set the fence on the table saw to the measurement needed. If you're cutting long, thin strips, place the particleboard on the table saw lengthwise. If you're cutting rectangular or square panels, place the particleboard on the saw perpendicular to the length. Turn on the saw. Push the board across the blade with both hands, using an assistant to help you. When the particleboard is at least 6 inches past the blade and is supported by the sawhorses, stop pushing. Turn off the saw. Reset the fence to the measurement needed for panels. Repeat the cut. Install a carbon-tipped, ATB, combination blade on a miter saw or radial-arm saw. Place long strips on the bed of the saw. Mark them with the measurements needed. Align the blade with the mark. Hold the strip against the fence with one hand. Use the other hand to make the cut. Install a 48-tooth combination blade on a circular saw. Set the depth of cut to 1 inch from the base of the saw to the highest tooth. Place the particleboard across four sawhorses. Place clamps on the sawhorses to secure the board. Measure the distance from the 90-degree fence or guide on the base of the saw to the side of the blade. Add the distance or allowance for the guide to the measurement needed for the cut. Mark the measurement needed on both sides of the board. Clamp a 3/4-by-4-inch-wide piece of hardwood plywood to the particleboard, aligning it on both sides with the marks. Don safety glasses and a face mask. Stand facing the edge of the particleboard with the plywood strip on the left side. Align the saw with the guide, placing the edge of the saw base on the particleboard. Don't allow the blade to touch the particleboard. Turn on the saw. Push the saw forward with your right hand, guiding the saw along the plywood strip to the other side. Draw or use a template to draw curves or patterns on particleboard. Clamp the board across two sawhorses. Install a carbon-steel, 1 3/4-inch-long blade in a jigsaw. Choose one that's designated for wood with at least 16 teeth per inch. Put on a face mask and safety glasses. Grasp the saw with one hand. Place the leading edge of the guide on the saw on the edge of the particleboard. Align the blade of the saw with the line. Turn on the saw. Push the saw forward with your hand, guiding it along the drawing by line of sight. Apply moderate downward pressure to the saw. Follow the pattern or drawing to the other side.